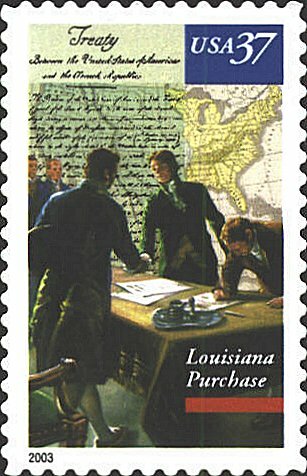 The stamp was issued to commemorate the bicentennial of the purchase of the Louisiana Territory in 1802. James Monroe is pictured signing the Treaty while Robert R. Livingston, U.S. Minister to France and Francoise Barbé, the French Minister of Finance shake hands. Two unidentified men also witness the signing. The representation of the Treaty of purchase is based on the English translation of the Treaty. The right side of the map represents the territory of the United States prior to the Purchase, while the left side shows a "shadow" map of the remainder of the country. In 1789 the Congress passed the Residency Act which authorized George Washington to select a site for a Federal District outside of any of the States. He selected a location on the Potomac River, a diamond-shaped tract of 100 miles, which were ceded by Virginia and Maryland. Andrew Ellicott was appointed by George Washington early in 1791 to make a survey of the site. Ellicott determined the latitude and longitude and began the survey in February. In March Major Pierre Charles L'Enfant was instructed to prepare a plan for the new city. L'Enfant came in conflict with the Commissioners and with Washington and was removed from the project in March 1892. The boundaries, 10 miles on a side, were completed by January 1793. In the upper quadrant of the stamp is a portion of Ellicott's survey based on Enfant's plan as it was engraved by Samuel Hill of Boston and appeared in the Universal Asylum and Columbia Magazine for March 1792. The "official" plan was engraved by Thackara and Vallance of Philadelphia and published a month later. The Capitol building, the Washington Monument, and the Lincoln Memorial, the red towers of the "Castle" of the Smithsonian Institution, row houses from the Shaw neighborhood and cherry blossoms are also included in the design.